A middle school math teacher in Dubuque is Iowa’s Teacher of the Year. Chris Burke was presented with the award on Thursday at Eleanor Roosevelt Middle School. Burke told KCRG-TV he learned that he’d been selected for the annual award just before a surprise assembly in the school’s gym. “I’m surrounded by an incredible staff. The mentors I’ve had over the years, I hold them in the highest regard, so to be even considered up with them on their platform, it means a great deal,” Burke said. 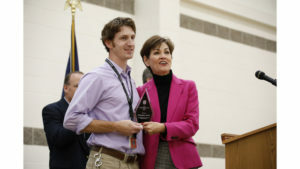 The Iowa Teacher of the Year award, sponsored by the Iowa Department of Education, was established in 1958. The 35-year-old Burke and his wife, Betsy – who’s also a teacher, have a one-year-old son, Max. The other finalists for the 2019 Teacher of the Year included; Leigh Ann Erickson at Mount Vernon High School, Kristine Howes-Vonstein at Vinton-Shellsburg Middle School, and Shelly Nash at Sioux City West High School.